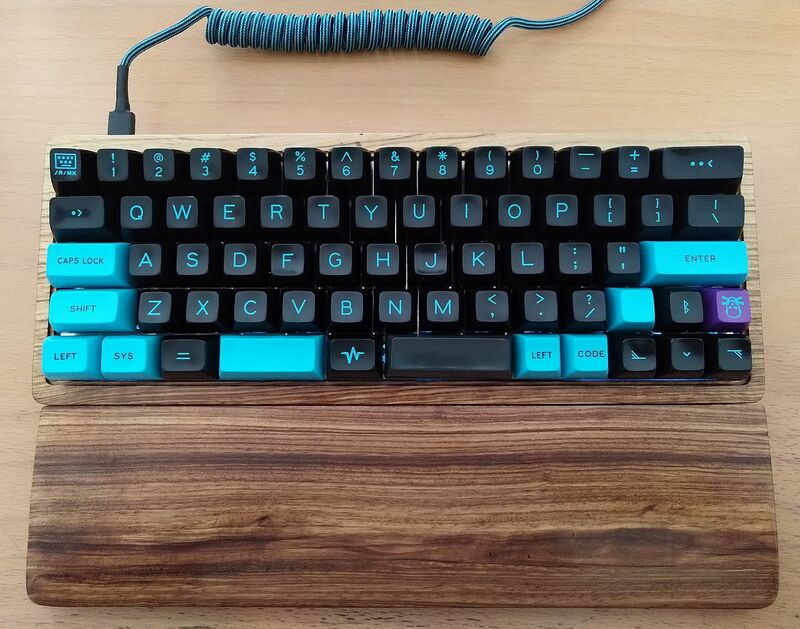 This is my first mechanical keyboard build. I might be wrong or do some weird choices, but eventually this helps people that are like me and feel a bit lost in the information overflow on that topic. 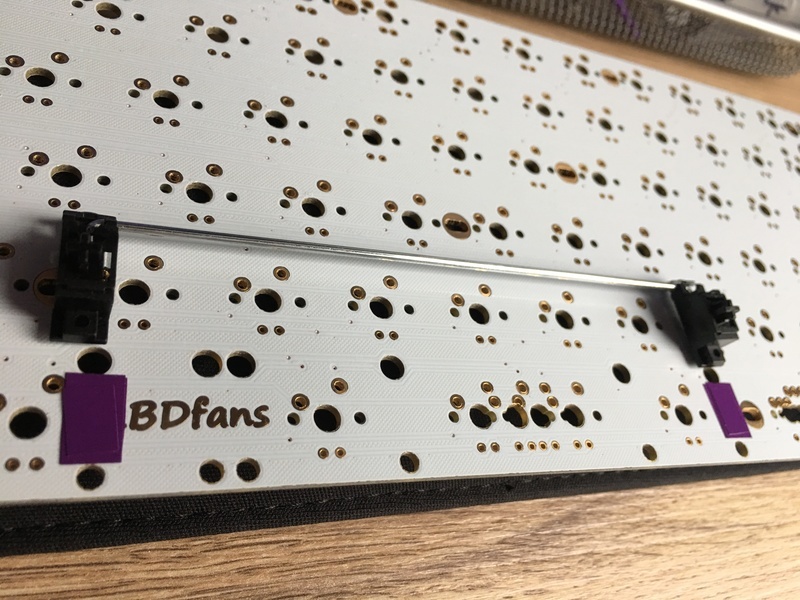 Generally, all the advice is somehow related to the DZ60 PCB from KBDfans. Stabilizers: they balance key presses along wider key caps like Backspace, Caps Lock etc. A good place covering the details is the Deskthority wiki. More information on the individual components below. RGB underglow. I'll probably use it to indicate layers and special keys like Caps Lock etc. One can choose between PCB- or plate-mounted stabilizers of various brands. If you get a universal plate, usually you need PCB-mounted stabilizers. If you plan to use a split space bar, you need to order additional 2u stabilizers (see section "Bill of materials"). According to broad agreement on the interwebs, original stabilizers from e.g. Cherry seem to have stable build quality where other clone brands vary in quality. Plates come in at least 4 different materials: Aluminium, steel, brass or carbon fiber. Brass ones are the most expensive amongst those. I don't know anything about the differences or if you can even feel any. Also important: the plate in combination with the PCB dictate what layout options you have (e.g. split space bar/backspace/shift). Cherry switches can be mounted by two methods: either plate-mount or PCB-mount. The difference is visible here: wasdkeyboards.com. Plate-mounted ones have a firmer typing feel, while PCB-mounted switches feel bouncier and have more flex. You can reuse PCB-mount switches on a plate by cutting the two guide pins at the bottom. Choose whatever you like. Using keyboard-layout-editor.com helps you with decisions regarding the layout, required key caps/switches etc. It seems the DZ60 fits any standard 60% case. Obviously you can simply choose a standard USB cable. If you're building your own keyboard, chances are, that you might want a pretty cable. I know Pexon and Clark Kable that assemble cables to your needs. These bits we're quite hard to find, as I either found no or inconsistent information on the Internet. Note that by being in Europe, some parts can be hard to come by and/or shipping fees are more expensive than the ordered components themselves. Here's a list of the shops I bought my stuff from. It's recommended to test PCB functionality before soldering anything. 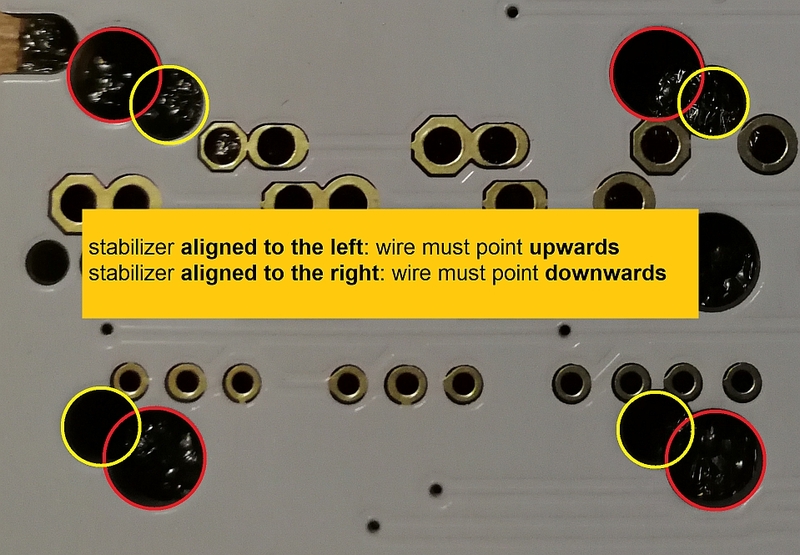 This helps to rule out PCB errors if you encounter errors after soldering. Mounting stabilizers and the "band-aid mod"
It seems one can reduce wobbling by adding band-aid or some other dampening and sticky tape between the PCB and stabilizers. After you've placed all stabilizers, mount the plate over it. It should align with the stabilizers nicely. Important: Make sure you know the exact position for every switch, as the location can vary depending on the chosen layout. If unsure, just mount all the switches before soldering. So, please read the QMK documentation - it's detailed and explains almost any step required to create your own layout. I made a custom layout - see the README for details: github.com/qmk/qmk_firmware. The hardest part for me was to realize that your layout obviously needs to base on a physical wiring configuration. See github.com/qmk_firmware and select the layout that matches your desired setup.